WASHINGTON-- The Elian Gonzalez saga moved to Washington Saturday, topping off a day of dramatic activity that included an armed pre-dawn raid by federal agents, widespread protests in three states, massive celebration in Cuba and a father-son reunion that ended nearly five months of separation. As Saturday came to a close, Elian and his father Juan Miguel Gonzalez were spending the first night of their reunion at Andrews Air Force Base near Washington, where Elian's Miami relatives had been denied entry to see the 6-year-old. 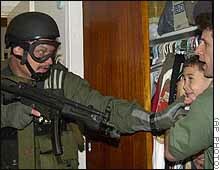 The day began before dawn Saturday, when U.S. Immigration and Naturalization agents seized Elian from the home of his Miami relatives, breaking down the door, firing pepper spray into an angry crowd of protesters, and taking the screaming boy away toward Washington in a white unmarked minivan. There were no reports of serious injuries from the raid. Once word spread of the seizure, dubbed Operation Reunion, so did unrest. Tension moved through Miami's Little Havana neighborhood as protesters spilled into the streets, lighting street fires and struggling with police carrying batons and shields. An angry crowd tore down the CNN tent at the house where Elian had lived. Shouting "Get out, get out," several dozen stormed into the tent and knocked its equipment over. At least 180 people were arrested. About 300 demonstrators angered by Elian's seizure also caused trouble in New Jersey, when their highway march blocked traffic for 20 minutes through the vital Lincoln Tunnel connecting New Jersey with New York. Protesters also marched near the United Nations in Manhattan, and the Cuban Mission there. No arrests were reported. Only a few hours after Elian had reunited with his father at Andrews Air Force Base, an entourage of Elian's Miami relatives arrived in Washington and drove to a Capitol Hill meeting with Sen. Bob Smith, R-New Hampshire. The group included Elian's great-uncle Lazaro Gonzalez, his brother Delfin Gonzalez and Marisleysis Gonzalez, the boy's cousin and a primary caregiver for the nearly five months since Elian's rescue at sea. Also in the group was Donato Dalrymple, the recreational fisherman who rescued Elian. Smith first met the family members, along with Elian, last January at their Miami home. The senator said Elian had asked him in Spanish to help him remain in the United States. After the meeting Saturday Smith said the family's anguish was painfully apparent on their faces. Later the senator accompanied Elian's Miami relatives to the air force base, presumably to arrange a meeting with Juan Gonzalez and/or Elian. But the motorcade was blocked from entering the base, and a public information officer said the Miami relatives were not authorized to enter. Juan Gonzalez did not wish to meet with the relatives, according to his lawyer Gregory Craig. Juan and Elian Gonzalez and their Cuban family members are expected to remain at the base for the next several days. Federal officials may eventually move them to the Wye River Plantation on Maryland's eastern shore, according to sources. The decision is not yet final, sources said. Wye River was the site of Palestinian-Israeli peace talks in 1998. The air force base, where the presidential jet Air Force One is housed, was the scene Saturday of Elian's reunion with his father. Although Craig said he did not witness the actual meeting, he did see them shortly afterward and Elian appeared "at ease." "I saw Juan Miguel and Elian within minutes afterward as they got out of the car and came to the location where they're going to be staying for the next couple of days on the air force base," Craig said. "It was clear that there was huge relief on Juan Miguel's face and a wonderful smile and ... comfortable physical contact between Elian and his father." Elian was seized on authority from the U.S. Justice Department, which ruled that the boy's Cuban father was his legal guardian and not his Cuban-American relatives in Miami. The Miami relatives fiercely oppose Cuban leader Fidel Castro and want Elian to remain in the United States. Elian's fate, however, remains unsettled. The courts will ultimately rule on whether the boy should stay in the United States. A federal appeals court is scheduled to hold a hearing in the case on May 11. Judges are expected to rule on whether Elian can legally file for political asylum to remain in the United States. In Cuba, emotions were festive at the site of a huge pre-planned demonstration calling for Elian's return, featuring Cuban President Fidel Castro. "Elian, friend! Cuba is with you!" chanted an estimated 400,000 people called by Cuba's communist government to gather at Central Australia, a well-known sugar refinery and processing center. It was from here that Castro commanded revolutionary troops who vanquished an exile army at the Bay of Pigs 39 years ago last week. Elian was rescued by two fishermen while clinging to an inner tube off the Florida coast last November 25. 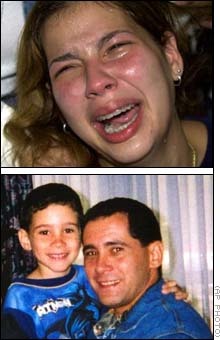 His mother and 10 others drowned when their boat sank while trying to reach the United States from Cuba. In addition to Elian, two others survived. Correspondents Patty Davis, Mark Potter, Susan Candiotti, Martin Savidge, Justice Department Correspondent Pierre Thomas and The Associated Press contributed to this report.